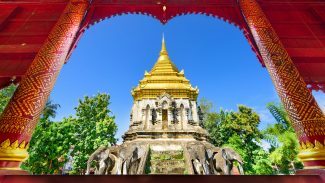 Chiang Mai is the largest city in Northern Thailand. The Old Town section of the city contains over 300 temples (wats), including the city’s oldest- Wat Chiang Man. You will find superb handicrafts in Chiang Mai’s Night Bazaar, and some great deals. Rudy also explores some of the villages of Chiang Mai, including Bor Sang.